How can a theory of the self be used to understand the psychotherapeutic process? The basic assumption of the 'dialogical self' is that there is no centralised 'headquarter' in the mind, but that the internal self is made up of a number of different 'characters'. Interpersonal relationships, from infancy onwards, become internalised - these internalised relationships then influence relationships during life. 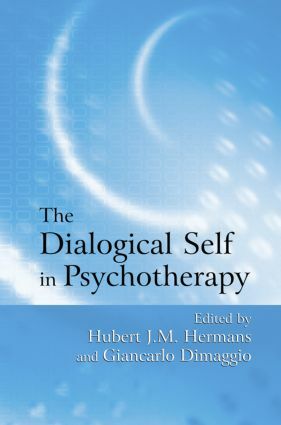 The Dialogical Self in Psychotherapy gathers together psychotherapists from divergent origins to explore current thinking in the field: cognitive, constructivist, process-experiential, narrative, psychodynamic, psychodramatic, humanistic, and cognitive analytic. This innovative book brings together inter- and intra-subjective dialogue and clearly demonstrates how they are incorporated into the therapeutic process. Part I: General Theory. Hermans, The Dialogical Self: Between Exchange and Power. Bertau, Some Considerations About the Development of the Dialogical Self. Lewis, Todd, Toward a Neuropsychological Model of Internal Dialogue: Implications for Theory and Clinical Practice. Cooper, Encountering Self-otherness: 'I-I' and 'I-Me' Modes of Self-relating. Part II: Theory and Clinical Practice. Angus, McLeod, Self-multiplicity and Narrative Expression in Psychotherapy. Stiles, Osatuke, Glick, Mackay, Encounters Between Internal Voices Generate Emotion: An Elaboration of the Assimilation Model. Whelton, Greenberg, From Discord to Dialogue: Internal Voices and the Reorganization of the Self in Process-experiential Therapy. Hermans, Hermans-Jansen, The Dialogical Construction and Reconstruction of a Personal Position Repertoire. Bromberg, Standing in the Spaces: The Multiplicity of Self and the Psychoanalytic Relationship. Verhofstadt-Denève, Dillen, Helskens, Siongers, The Psychodramatic 'Social Atom Method' with Children: A Developing Dialogical Self in Dialectic Action. Part III: Reconstructing Dialogical Processes in Severely Affected Patients. Neimeyer, Arvay, Performing the Self: Therapeutic Enactment and the Narrative Integration of Traumatic Loss. Dimaggio, Salvatore, Catania, Strategies for the Treatment of Dialogical Dysfunctions. P.H. Lysaker, J.T. Lysaker, Dialogical Transformation in the Psychotherapy of Schizophrenia. Semerari, Carcione, Dimaggio, Nicolò, Procacci, A Dialogical Approach to Patients with Severe Personality Disorders. Part IV: Methodological Issues in the Psychotherapeutic Process. Osatuke, Gray, Glick, Stiles, Barkham, Hearing Voices: Methodological Issues in Measuring Internal Multiplicity. Leiman, Dialogical Sequence Analysis. Hubert J.M. Hermans is emeritus-professor of psychology at the University of Nijmegen, The Netherlands. Giancarlo Dimaggio, M.D., is a psychiatrist and psychotherapist at the Terzo Centro di Psicoterapia Cognitiva, Rome.